On the REUK.co.uk site there are already instructions on making simple solar water heaters – for example a basic solar water heater which is ideal for camping and can be made in a few hours with cheap components. These home made solar water heaters are nowhere nearly as efficient as commercially available evacuated tube solar water heating but they are far cheaper. The next step up in DIY solar water heaters is concentrated solar water heating. Concentrated solar water heaters are more complicated to construct and more expensive, however they can be very efficient and great fun to build. The key concept in concentrated solar water heating is the use of mirrors or other reflective surfaces to concentrate the sun’s rays hitting a large area onto a tube or container full of a fluid which is heated. The overall idea is very similar to that employed in a solar oven, magnifying and focusing the solar radiation incident upon a large area onto a small volume. Click here for our Introduction to Concentrated Solar Power for more information on the basics of CSP. The key component of a typical DIY (and many commercial) concentrated solar water heater is a parabolic trough which focusses all of the sunlight hitting it onto a pipe through which oil is being pumped to be heated up. Obviously a large parabolic mirror would be extremely expensive, so some efficiency has to be sacrificed in order to bring costs down. The structure of the trough itself does not get very hot – primarily because it reflects away the suns rays rather than absorbing them. Therefore the trough itself can be made simply of a thin layer of flexible material such as formica, MDF, or plywood. 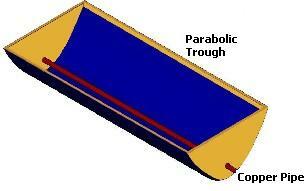 Next you need to cut two parabolic shaped end supports for your trough from plywood or MDF sheet. 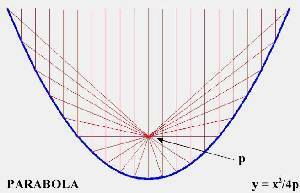 Below is an example parabola with a focal point (vertex of the parabola) suitably close to the base of the trough. If you print this, or any other similar parabola onto 2mm squared paper (PDF), you then you can scale it up on the support sheet material to get parabolic curves of the required size. When printed, the parabola displayed above is exactly 80mm wide. Therefore if you want your trough for example to be 1 metre (1000mm) wide you need to scale up by a factor of 1000/80 = 12.5×. So, if this parabola is printed on 2mm squared paper, you would need to draw a grid of squares 2 × 12.5 = 25mm wide on to the end support material. The parabolic curve can then be copied freehand onto one of the supports using the printout as a guide, and cut out using a jigsaw. That finished support can then be used as a template for the second support to ensure both are identical. Finally drill a hole with the same diameter as the pipe you intend to pass through your collector into the end supports centred exactly at the focal point of the parabola. 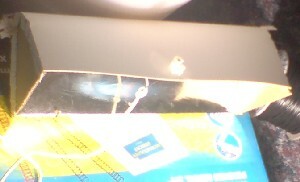 The thin flexible trough backing sheet material can then be bent around the two end supports – one at each end – and securely fixed with glue and screws. If the centre of the trough opens up a lot because the material you used is very flexible then wire can be used to pull the sides closer together at the centre and/or a wooden frame can be built around the outside of the trough to keep everything straight and ensure the sun’s rays will be well focussed on the pipe. The inside of the trough must next be covered with a highly reflective material such as aluminiumised mylar (a reflective plastic sheet), or flashing. 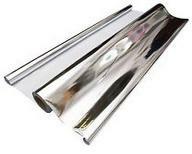 Pictured above is a 10m x 1.25m roll of silver mylar priced at the time of updating this article (January 2014) at £14 plus £5 for delivery. Click here to buy Reflective Sheeting and to see the wide range of suitable products available. It is obviously easier to attach the reflective material to the trough backing material before bending it into the trough shape BUT if you do this, there is a chance of the reflective material creasing or otherwise being damaged when bent. Try your reflective material on an off cut of your trough backing sheet to see if you can apply the reflective sheet before bending the trough into shape, or if it would be better to apply it afterwards for better results. It is well worth making a scale model (pictured above) of your proposed solar collector design using mirrored card (available online – mirror card) before making the full-sized version. See details and our results of Testing a Concentrated Solar Water Heater Prototype Parabolic Trough here. 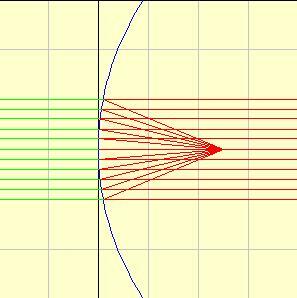 Every parabola has a focal point at which all light hitting the parabola is focussed. For our three dimensional parabolic trough we have a straight line of focal points along which we run the pipe through which the fluid to be heated will be circulated. Standard copper pipes must be used rather than the newer push-fit plastic pipes. Plastic pipes will melt at around 90 degrees, far below the the temperature which can be reached by the pipe in this type ofsolar collector. Painting the pipe with matt black paint will maximise heat absorption. We used to recommend common motor oil for the heat transfer fluid to be circulated through the pipe as it is made to be heated to very high temperatures, it is not corrosive, and it is relatively cheap and easy to find. Similarly we also used to recommend automotive antifreeze as an alternative. However, since there is a chance of leaks with any DIY solar water heating system we now suggest that a professional non-toxic heat transfer fluid such as polypropylene glycol be used. 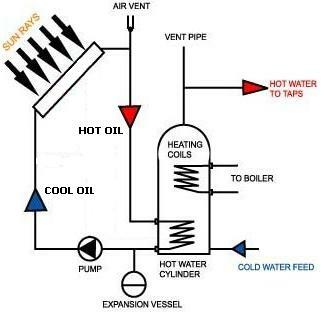 The heat transfer fluid is pumped around a closed system with a small pump through the solar collector and on to a coil fitted in the hot water tank. When the hot fluid passes through the coil in the tank, much of the heat it gained from the concentrated sunlight is transferred to the water in the tank which heats it up. At the same time the fluid in the pipe cools down ready to be reheated when it circulates back to the solar collector. Twin coil hot water cylinders (tanks) are available (click here to view our article on where to buy a twin coil cylinder), but it is sometimes possible (though difficult) to add a second coil to an existing standard cylinder. Obviously there will be times when the pipe in the trough is cooler than the hot water tank – in particular, from the evening until the trough warms up again some time the following morning. In order to prevent the contents of the hot water tank being cooled by being circulated through the cold trough all night, a Solar Water Heating Pump Controller is the last essential component of this type of system. Thanks for the nice article of how to build a cost effective solar water heater. I may have an improvment to your system to convert into a steam generator. Having been a home brewer for many years I know that many syrups are cooked down in a vessel with a vacuum pump attached. I don’t remember the exact temperature, but I believe that water boils at around 140 degrees F. If the water tank being heated was a boiler and had a vacuum pump attached then it could power a simple steam turbine engine. Keep up the good work!